The University of Nevada, Reno asked KPS3 to create the best college website design in the country, with a focus on recruiting new students. 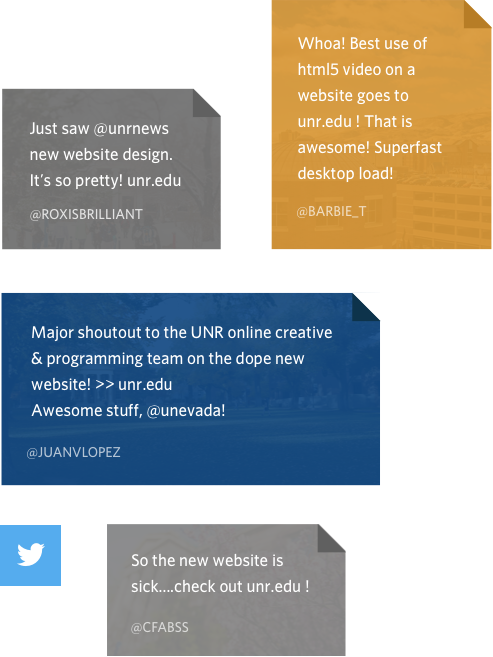 It’s not just about a beautiful design - it’s about a website that fully immerses prospective students in an experience that helps them understand the culture and offerings of the University of Nevada, Reno and become excited to attend. While a University website serves many audiences, from students to alumni to faculty and staff, we worked with the client to focus on the audience that keeps the doors open - prospective students. In order to attract them to the University, we would need to immerse them in the beauty of the campus while showing the technology that makes Nevada a progressive and modern University. We needed to design the information in a way that was engaging and interesting. We submerged ourselves in website analytics to provide insights and give us the data we needed to build a compass for the direction of this website. In addition to the knowledge University staff brought to the table about prospective students, analytics filled in the gaps about the content and interests of site visitors. This data also showed increasing mobile visits/usage (both tablets and cell phones), and with a typical audience of 17 and 18-year-olds, we all knew that number would only increase. The website mobile experience needed to be every bit accessible and engaging as the desktop version. Any time we work on a project with so many stakeholders, we make sure we’re aware of who’s involved in evaluation. We needed everyone on board and we needed to remind administrators and University officials of the primary objective of the site (new student recruitment), so that when respective departments and stakeholders came requesting homepage prominence, we could preserve the new focused purpose of the website and stay on strategy to meet the project’s objectives. 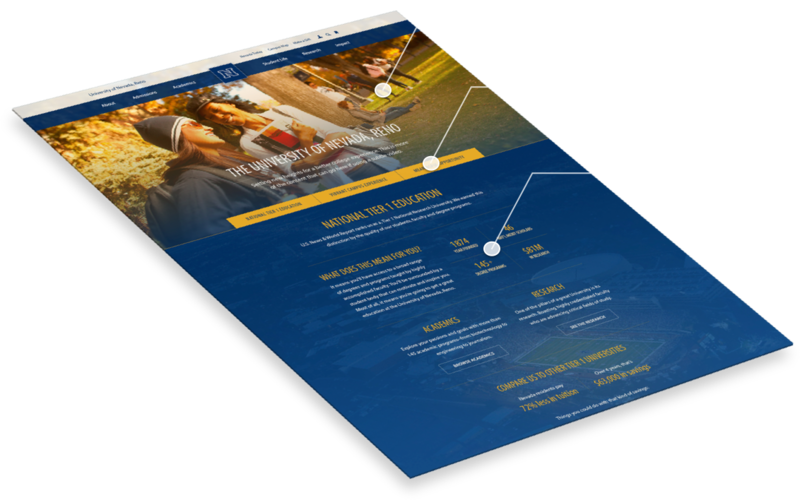 With new student recruitment as the primary objective and a wealth of beautiful photography and video, we showed off the campus experience with completely custom, long, scrolling pages on all landing pages. On the homepage, we feature full screen, HTML5 video, parallax effects, sticky headers, and custom interactions on almost every single element on the page. No matter the season, the homepage helps the prospective student feel as though they’re walking through campus in person. The site truly feels alive and vibrant - characteristics of the campus that the University wanted to be sure their prospective students were exposed to. This website is not simply a dull online brochure for a college. It’s an experience, a narrative and an attractive representation of why a student should select the University of Nevada, Reno. (homepage, academics, admissions, student life, etc.) immersed the visitor in a guided tour of the most important information for that section (with calls to action to learn more about any one topic that interested them from those landing pages). The proof of success is in the enrollment numbers as time goes on. The Fall 2014 semester featured record numbers for enrolled students (nearly 20,000) and incoming freshmen (9.8% increase). While we won’t give the website full credit for that outstanding result, we know that website research is a major part of any student’s college selection process. Anecdotally, the University has received a flood of positive feedback from all audiences, including prospective students - one such student even described the new site as “dope” (high praise from a 17-year old).